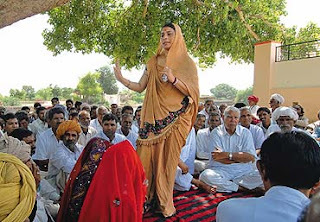 Home > Ministry of Rural Development > Government to bring amendment to raise to 50 % reservation for women in panchayats from existing 33% in coming Budget Session. Government to bring amendment to raise to 50 % reservation for women in panchayats from existing 33% in coming Budget Session. The government today said that it will pushamendments for increasing to 50 per cent the reservation for women in Panchayats from 33 percent in the coming Budget session of Parliament. Speaking at a National Workshop here on 'Implementation of PESA Act: Issues and way forward', Union Minister of Rural Development and Panchayati Raj Shri Birender Singh said though some States had provided 50 per cent reservation to women in Panchayats, but through the Constitutional Amendment, it will be implemented in the whole country. He also expressed hope that all Political Parties will extend support in the passage of the amendment. The Minister also informed that it will also bring about changes in law to reserve the ward for women for two terms of five year each from the existing single term so that they can undertake developmental activities in a continued fashion. Shri Singh said on the basis of the report of the Bhuria Committee submitted in 1995, PESA was enacted in 1996 to extend Part IX of the Constitution with certain modifications and exceptions to Fifth Schedule areas in 108 districts in 10 States. The Minister also made a strong pitch for the faster implementation of the Panchayats (Extension to the Scheduled Areas) PESA Act by states for the uplift of tribals, saying that they cannot wait any longer for development as they had already waited for 65 years. He said that effective implementation of PESA will enhance people’s participation in decision making at local level as tribal population will feel more comfortable to raise their issues and concerns in smaller Gram Sabhas at village level rather than at Gram Panchayat level. Speaking on the occasion, Union Minister of State for Panchayati Raj Nihal Chand said that PESA will have a positive impact in preventing and checking extremism and resentment among tribal population if implemented effectively. He also thanked the NDA government for organizing such a workshop on PESA after 20 years in force to assess the effectiveness of the Act and to chart new course of action. Shri Nihal Chand said that financial assistance under the 14th Finance Commission award is also available to the Fifth Schedule Areas for supporting and strengthening the delivery of basic services. Panchayati Raj and Tribal Development ministers from 10 states are attending the workshop. Agenda for the discussions in the two-day workshop include framing of PESA Model Rules; compliance of the provisions of the State Panchayati Raj Acts and Subject Laws with provisions of the PESA Act; empowerment of Gram Sabha; strategies for capacity building; infrastructure and staff in Gram Panchayats and effective utilisation of grant of Fourteenth Finance Commission awards etc.